In a case in which the couple has considerable assets, one of the bigger challenges can be dividing the community estate. In one divorce that involved a high-value community estate and allegations of hidden assets, the Sixth District Court of Appeal reversed a trial court’s order that divided the estate. The trial court’s division improperly gave the wife duplicative benefits regarding certain assets when the statute did not allow the wife to receive such benefits. Additionally, the husband had certain luxury vehicles and brokerage accounts. Some of these assets were things that the wife accused the husband of hiding. After a hearing, the court entered its order, which prompted an appeal from the husband. While the husband’s appeal addressed many issues, one item that the appeals court deemed persuasive was his argument that the trial judge made improper duplicative awards. In this case, the trial court awarded the wife 50% of the community property. On top of that, it awarded her half of the proceeds of the husband’s sale of an $18,000 Porsche automobile and 100% of the income the husband received from his side business (which amounted to $58,000). By crafting its order this way, the trial court’s order had the effect of giving the wife her $9,000 from the Porsche sale and her half ($29,000) of the husband’s side business twice. The wife built her argument around the husband’s alleged misconduct. She argued that the husband’s acts of improperly failing to disclose certain assets meant that any amounts awarded above 50% by the trial court should be properly considered to be penalties for the husband’s improper non-disclosure. In your divorce and marital estate division case, you need diligent and determined counsel representing your interests. 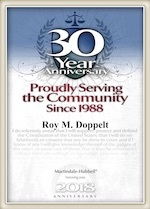 The skilled San Diego divorce attorneys at Doppelt and Forney, APLC have been assisting clients throughout Southern California, including in San Diego, Encinitas, La Jolla, and Chula Vista, for many years. For a free consultation, reach out to Doppelt and Forney, APLC through our website or call toll-free at (800) ROY IS IT (769-4748).